In probability theory, statistics and econometrics, the Burr Type XII distribution or simply the Burr distribution is a continuous probability distribution for a non-negative random variable. It is also known as the Singh–Maddala distribution and is one of a number of different distributions sometimes called the "generalized log-logistic distribution". It is most commonly used to model household income (See: Household income in the U.S. and compare to magenta graph at right). 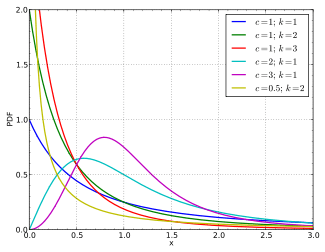 Note when c=1, the Burr distribution becomes the Pareto Type II distribution. When k=1, the Burr distribution is a special case of the Champernowne distribution, often referred to as the Fisk distribution. 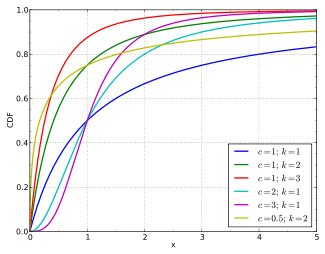 The Burr Type XII distribution is a member of a system of continuous distributions introduced by Irving W. Burr (1942), which comprises 12 distributions. Dagum distribution, also known as the inverse Burr Distribution. ↑ Burr, I. W. (1942). "Cumulative frequency functions". Annals of Mathematical Statistics. 13 (2): 215–232. doi:10.1214/aoms/1177731607. JSTOR 2235756. ↑ Singh, S.; Maddala, G. (1976). "A Function for the Size Distribution of Incomes". Econometrica. 44 (5): 963–970. JSTOR 1911538. ↑ Maddala, G. S. (1996) . Limited-Dependent and Qualitative Variables in Econometrics. Cambridge University Press. ISBN 0-521-33825-5. ↑ C. Kleiber and S. Kotz (2003). Statistical Size Distributions in Economics and Actuarial Sciences. New York: Wiley. See Sections 7.3 "Champernowne Distribution" and 6.4.1 "Fisk Distribution." ↑ Champernowne, D. G. (1952). "The graduation of income distributions". Econometrica. 20 (4): 591–614. doi:10.2307/1907644. ↑ See Kleiber and Kotz (2003), Table 2.4, p. 51, "The Burr Distributions." Rodriguez, R. N. (1977). "A guide to Burr Type XII distributions". Biometrika. 64 (1): 129–134. doi:10.1093/biomet/64.1.129.